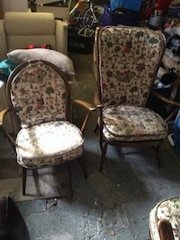 A pair of vintage mahogany balloon back dining chairs on carved legs upholstered to the seats in damask patterned satin. 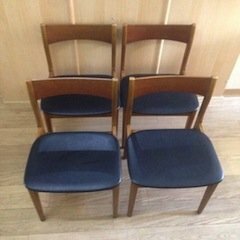 A set of four vintage elm wood low back dining chairs, upholstered to the seats in black leather. 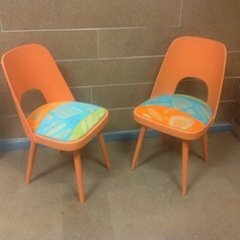 A pair of retro curved back orange plastic dining chairs, upholstered to the seats in colourful patterned fabric. 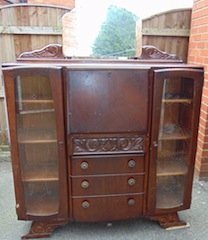 A dark oak heavily carved art deco display cabinet with a mirror to the top, having two glass door cupboards either side a pull out desk and three drawers. A solid wood gold and silver painted high back hall chair, upholstered to the seat in silver velour. 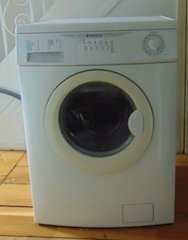 A white under counter Bendix 1400 spice 9kg washing machine. 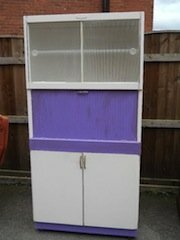 A tall standing retro white and purple solid wood dresser, having a glass inlaid cupboard above a pull down desk and a double cupboard. 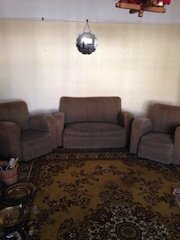 A three piece art deco sofa suite, comprising a two seater sofa and matching armchairs, upholstered in chocolate brown suede. 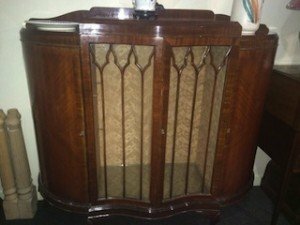 A vintage glazed mahogany glass inlaid double door drinks cabinet/ display cabinet. 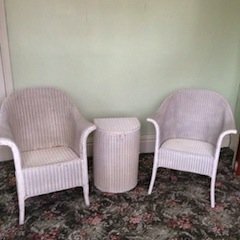 A pair of white painted Lloyd Loom rounded back armchairs, together with a matching laundry basket. 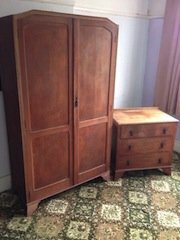 A solid wood tall standing double wardrobe, together with a matching chest of three drawers. 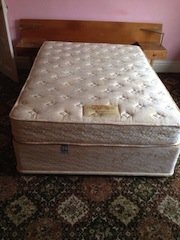 A cream and yellow double divan bed base on castors, together with a matching bounce back mattress. 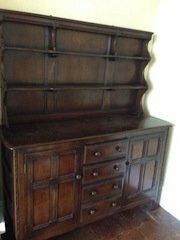 An enrol Welsh tall standing kitchen dresser, having two plate shelves above a counter top, and a cupboard to either side of four central drawers. 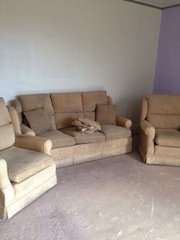 A three piece sofa suite, includes a three seater high back sofa and two matching armchairs, upholstered in camel fabric. 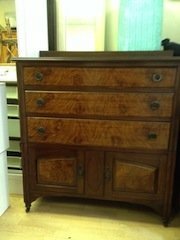 A vintage solid wood dresser, having three large drawers above a double cupboard. 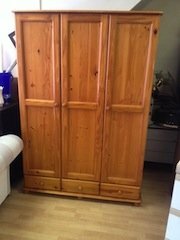 A tall standing solid pine triple wardrobe on ball feet, having three slim doors above three drawers. 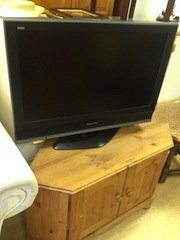 A Panasonic 32 inch flat screen HD LCD television, together with a solid pine corner tv unit. 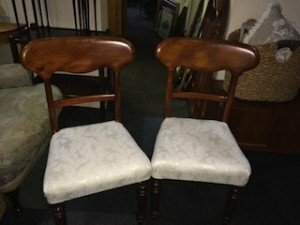 A near pair of vintage mahogany hall chairs, upholstered to the seat and backrest in figural patterned fabric. 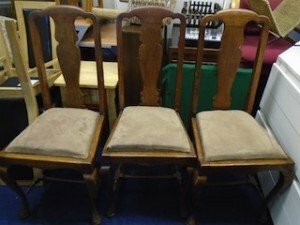 A set of three vintage high back solid wood dining chairs, upholstered to the seats in cream velour. 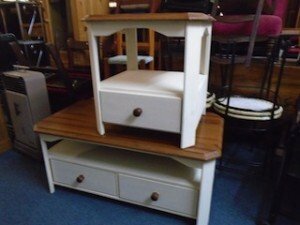 A solid wood painted white rectangular coffee table with two drawers, together with a matching one drawer side table.